Various designs of gantt charts, timelines and charts on project planning. The template Roadmapping is a great tool to use for the development of new products or for the core of your product strategy. Effectively utilizing the Road Maps template set can take substantial work off your hands when developing a new product. It can serve as medium of communication as well as provide an overview of how a product is evolving in a certain period of time. Milestones and important dates are visible here at a glance. A good project needs a fine idea. 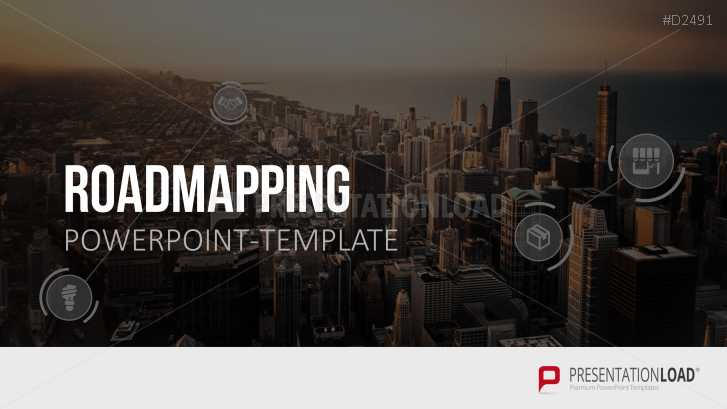 Roadmapping templates are able to visualize your ideas and to subdivide the production process in a few simple steps. Thereby, road maps integrate not only the vision, but also the strategy concerning a new product. In order to display this thought adequately, our set of templates contain a selection of individually designed road maps. They include graphics of streets and geographical maps to which you can add arrows, flags and pictures with comments. In addition, our templates include a portfolio of Gantt charts and timelines as well as a toolbox with graphic modules. A freind of mine recommended this PPT shop and I've been surprised to find just how useful these premade-slides are! Just fabulous to project business strategies and present your own informaton in a high design quality. Thanks PL!